Though it serves little other purpose, the Jot Roller-Tip rollerball is a good example of why people should care, at least a little, about purchasing a decent pen. After all, it’s the sort of pen that typically doesn’t warrant a second thought. It is very inexpensive, it looks nice enough, and it even has a relatively fine, 0.5mm tip . But even for the dollar or two I paid for a 3-pack, these pens are really just a waste of money. The Jot Roller-Tip is probably one of the more inconsistent pens I’ve ever written with. Thick lines, thin lines, or no lines, you never know what you’re going to get when you put this pen to paper. It’s scratchy and rough to write with, the clip is flimsy, and the plastic end of the barrel even pops off when it clearly shouldn’t. Throw this pen in a backpack or purse at your own peril. Uh… I don’t think that’s supposed to just pop off like that. On the positive side, the ink is quick-drying and, though it lacks a soft-grip section, it’s certainly comfortable enough for most uses. Still, it’s not enough to make a difference. 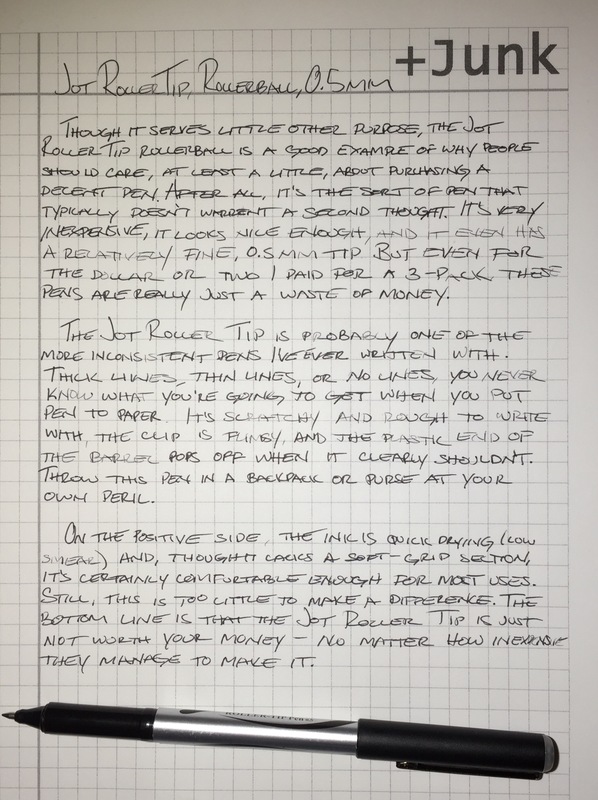 The bottom line is that the Jot Roller-Tip is just not worth your money – no matter how little they’ll charge. I have some of these. One day it’s a great pen, and on another I want to chuck it in the garbage. Yeah, you can even see it in the writing sample here. It writes fine for the first couple of sentences, then it just sort of cuts out and writes very weakly. Then it just goes in and out for the two following paragraphs. I had to throw 2 of them away, they were useless. The 3rd one is mediocre at best. Bought them at Dollar General cuz I was in a hurry. Won’t buy them again.